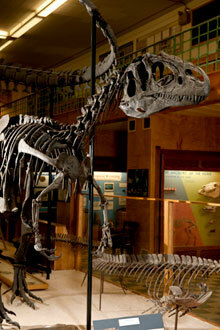 Allosaurus was the most common large carnivore of the Late Jurassic in North America. It was a smaller predecessor of the Cretaceous Tyrannosaurus. Strong forelimbs with sharp claws, powerful hind legs and recurved, dagger-like teeth are evidence that Allosaurus was a formidable predator. Although it was much smaller than sauropods like Apatosaurus (Brontosaurus), which were also common at the time, quite possibly Allosaurus hunted in packs to bring down larger prey. Like many meat eaters, it may also have been a scavenger. This specimen of Allosaurus shows evidence of injuries that may have resulted in the animal's death at a relatively young age. "Big Al" was featured in the BBC's "Walking With Dinosaurs: Allosaurus" video.